What is most detestable about Donna Cover’s letter to the editor in the November/December 2018 issue is not that she obviously hates President Trump—unwarranted as her aversion is, in view of his being our country’s greatest president ever as well as Israel’s unsurpassed White House friend—but that she apparently takes for granted that all decent people share her assessment. Clearly she fancies that “our religious leaders,” with one voice, harbor her hostile feelings toward our president but are merely refraining from expressing them because of a belief that their voices should be “muted.” How dare she compare this muting to the “bystander effect” during the Holocaust. 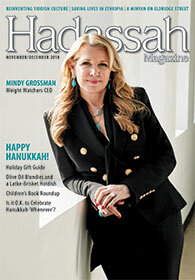 In the November/December 2018 issue, the article “A New Yiddish Tradition” struck a chord with me, as no Hadassah Magazine article ever has. One line in particular resonated: “For many who are turned off by mainstream, synagogue-and-Israel-oriented Judaism…embracing Yiddish is a way of embracing an organic Jewish life.” As a secular Jewish millennial, I count myself among those turned off by “mainstream” ways of being Jewish, and have struggled to find authentic ways of connecting with my heritage. I was very happily surprised to see Hadassah Magazine addressing issues relevant to young secular Jews in this article. Concerned rabbis and relatives alike have been asking, over and over, “Why are young people drifting away from Judaism? What can we do to bring them back?” Perhaps this article shares part of the answer. Perhaps, along with the Jewish food, music and dancing that we may already know and love, we need to embrace the languages of our ancestors. Like the author, I grew up hearing a Yiddish phrase here and there, but I would love to help keep the rich language of my grandparents and great-grandparents alive by learning to speak it fluently. Thank you for providing so many Yiddish language resources and events in this article. I would be thrilled to see more articles focusing on elements of secular Judaism in the future! IT’S A DATE! OR IS IT? Vanessa Ochs’s commentary, “Playing With the Jewish Calendar” (November/December 2018), disturbed me. We celebrate other Jewish holidays—Rosh Hashanah, Yom Kippur, Sukkot—based upon instructions in the Torah; we wouldn’t think of observing those festivals whenever we feel like it. Hanukkah should be no different, even if its observance isn’t prescribed in the Torah. Family get-togethers are fine, and we can remember the heroism of the Maccabees whenever we want to, but let’s leave the observance to when it’s supposed to be. Here we are in 2018, trying to figure out when to celebrate Hanukkah. We sure have come a long way. I am in my 80s. As a child, Hanukkah was not even considered a major holiday, let alone having it be a special event for families to get together. Potato latkes, sour cream and a sprinkle of sugar with applesauce on the side was the complete celebration. Then my generation became envious of our Christian friends receiving Christmas gifts. Thus, the little gifts for each night of Hanukkah became the equalizer. Then, we fast-forwarded to big gifts. And here we are today, discussing when to celebrate as a family—this holiday that has risen from a simple experience to something very special. I am all for accommodating family members in these busy times. I say, do whatever it takes to bring families together—and more importantly, don’t forget to bring a gift! I would like to share my family’s experience observing Jewish holidays. It is very common for us to hold a Passover seder on the Saturday evening during the week of Passover. Our seder is usually not celebrated on the first or second night of the holiday. Had we not made this adjustment, we would not be with our daughters and our grandchildren for the occasion, as they live too far away to come during a weeknight. My husband and I took our cue from other military families who often celebrate Christmas at other times of the year, when their spouses are home from deployment. It works for them as it does for us. since the 13th century) synagogues in Prague? It is indeed a tribute to our collective resilience that Jewish life exists not just in Israel and the United States, but also in places where you wouldn’t expect it any more. I’ve visited Jewish Tuscany, Florence, Venice and Rome. These communities are vibrantly alive, albeit in a different way from the days of old. I am a proud American with cherished European roots and history that I will never stop talking about. While Tatyana Sundeyeva’s interesting article on Jews in Europe presents a somewhat depressing picture, it is also important to acknowledge our debt to the many Christians in Italy who saved almost 80 percent of that country’s Jewish population during the Holocaust. In Siena specifically, of the approximately 250 Jews living there in 1943, 15 were rounded up and sent to Nazi death camps. A group of nuns from a Siena convent as well as local priests urged the community to hide their Jewish neighbors, saving the overwhelming majority of them. How delightful to see Sydney Taylor’s “newest book” given such prominence in the children’s book review roundup in the November/December 2018 issue. The All-Of-A-Kind Family Hanukkah story, as told by Emily Jenkins and illustrated by Paul Zelinsky, is really for everyone. I’m taking my 8-year-old niece to a book talk where she will get an autographed first edition. Then we will go home and start reading the original series. I am also buying copies for my adult friends who loved Syd as I did. She was my dance counselor at Cejwin Camps, and I knew all of her sisters in their various camp roles as well. I am quite sure that Syd would approve of this delightful way of introducing new generations of readers to the Lower East Side through the adventures of a Jewish family. Thank you Gertrude Donchin Chityat for expressing support for our President. President Donald Trump has been a consistent supporter of Israel and the Jewish people. He served as the Grand Marshall in NYC’s 2004 Israel parade – long before he announced for President. After a long line of Arab-appeasing presidents it is Donald Trump who kept his promise to move the U.S. embassy to Jerusalem. Instead of another Anti-Semitic State Department careerist President Trump has appointed an ambassador to Israel who has corrected the language the United States uses when referring to the Golan, Judea and Samaria. And it is President Donald Trump who has reduced the U.S. foreign aid dollars that the Palestinian Authority pays to the families of terrorists.